Want to drive more traffic from social media? With the right set of social media plugins, it’s possible to make your content go viral and increase social media traffic to your site. In this article, we’ll share the best WordPress social media plugins and help you decide whether you need to add them to your social media toolbox to grow your traffic. Social media is one of the largest traffic sources you can tap into. You can use social media to raise brand awareness, increase your exposure, and drive traffic. With the right strategies and toolset, you can use social media opportunities to grow your online business. Add social media share buttons and display social share counts on your blog posts. Schedule blog posts to be shared on social media directly from your WordPress dashboard. Display social media icons that link to your social media profiles. Create social logins on your site so users can quickly register with your site and log into your site with their existing social IDs. Shared Counts is a lean social media plugin for your WordPress site that quickly retrieves, caches and displays various social sharing counts by using SharedCount.com API. This is by far the fastest social sharing plugin on the market. Most other share plugins slow down your website, but this one was written by highly-reputable developers who value performance. It was built to be developer-friendly, so you can easily customize it to match your website’s needs. It supports share counts for Facebook, Pinterest, LinkedIn, Twitter (using the NewShareCount API), Stumbleupon, and also supports email sharing. Get started with Shared Counts today. 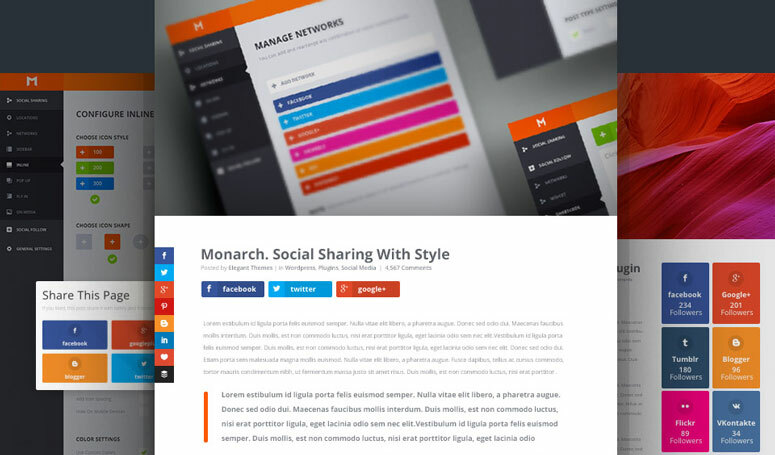 Monarch is a premium social media sharing plugin developed by Elegant Themes, a premium hub for WordPress themes and plugins. With Monarch, you can add share buttons in 5 different locations: floating sidebar, above or below content, on images and videos, automatic popup, and automatic fly-in. In addition to social sharing, Monarch allows you to place your social follow buttons in your sidebar or use a shortcode within your page / post content. It is highly customizable and allows you to choose button shapes, colors, and hover effects. Get started with Monarch today. Social Warfare is another social sharing plugin that is both beautiful and feature-rich. It gives you control over what people share on social networks, and how they share it. You can add custom images, custom titles, and custom descriptions for your posts to boost clicks and increase traffic to your site. Popular posts widget: Display your most popular blog posts in a widget based on the number of social shares. Analytics tracking: You can track how your social shares are performing using your Google Analytics account. Share recovery: You can recover share counts when switching permalink structures. Get started with Social Warefare Pro today. Revive Old Post allows you to automatically share your new and old posts on your social media accounts. It enables you to share your content on multiple platforms including Facebook, Twitter, and LinkedIn. It also allows you to track clicks and figure out what resonates best with your followers. It enables you to set a sharing interval for your blog posts and choose the number of posts to share. You can also post with featured images in your tweets to boost your click-through rates. Get started with Revive Old Post today. Sassy Social Share helps your website visitors share your content on their favorite social media sites. Currently, Sassy Social Share supports 100+ social media and bookmarking sites. The plugin is mobile responsive, so your social media icons can be adapted to the screens of your visitors’ devices. Sassy Social Share is a lightweight plugin optimized for high-speed page rendering. Despite being a free plugin, their enthusiastic support team has maintained a good track record for quick support queries resolution. Get started with Sassy Social Share today. AddToAny is one of the most popular universal social sharing platforms. With the AddToAny plugin for WordPress, you can allow users to share your content via share buttons. You don’t have to register an account with any third-party sites to make it work. The plugin supports over 100 social media sites and apps. It comes with counters as well as responsive floating share buttons that you can place at the most optimal locations on your site. Best of all, you can measure the engagement of your users with the sharing plugin via Google Analytics integration. You can also track shared links with the Google URL shortener. Get started with AddToAny today. If you’re after a WordPress plugin that sends updates to your Buffer account for scheduled publishing to social networks, then WordPress to Buffer is the right choice. Unlike most other plugins featured in this post, WordPress to Buffer doesn’t display the share count or a share button counter on your website. Instead, it helps you define the social media status for your WordPress site and schedule your content on your Buffer account directly within your WordPress dashboard. 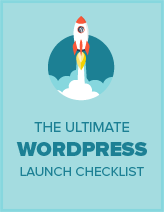 Get started with WordPress to Buffer today. Simple Social Icons is an easy to use social media plugin that allows you to display social media icons that link to your social profiles from your website’s sidebar. This free plugin was developed by StudioPress, a leading WordPress themes company. You can add or reorder icons per your preference. You can also customize the size and color of your icons and align them the way you want. Get started with Simple Social Icons today. Social Icons Widget is another plugin that allows you to quickly add social media icons to your sidebar using a widget and link them to your respective social media profiles. It allows you to add as many social icons as needed. It comes with a color picker that lets you to change the color, and hover color, of all your icons. Get started with Social Icons Widget today. WordPress Social Login enables your website visitors to easily register an account with your site by using their existing social account IDs. That way, users can conveniently register for an account on your site in just a couple of clicks. They won’t even have to remember a separate username / password just for your site. With WordPress Social Login, you can even import your users’ contact lists from Gmail, Facebook, Windows Live, and LinkedIn. Get started with WordPress Social Login today. Instagram Feed allows you to display Instagram photos from any non-private Instagram accounts. Integrating your Instagram feed with your site is a time saver, so you don’t have to repost your photos manually on your site from Instagram. Whenever you post on Instagram, the posts will be displayed automatically. The plugin also allows you to include a follow button beside your photos which can help you grow your Instagram followers. Get started with Instagram Feed today. Better Click to Tweet allows you to easily create Tweetable content for your readers. All you have to do is add a shortcode around the content that you want to make Tweetable. When your visitors click on the Tweetable content, a popup will appear asking users to submit the Tweet. Better Click to Tweet supports URL shortener, giving you the ability to utilize the maximum number of characters possible. It also allows you to track the engagement of your Tweetable content. A premium addon is available that allows you to select from the different style options. Get started with Better Click to Tweet today. If you want an easy way to display social share counts on your blog posts, then Shared Counts plugin is the best choice. It’s not only developer-friendly but optimized for speed as well. That means the plugin is highly flexible without compromising on performance. If you’re looking for a premium plugin that provides seamless social sharing for your users and also offers excellent customer support, then you should look into Social Warfare. If you want a social sharing plugin that has popups, slide-ins, and other features, then you should use Monarch. In addition to social sharing, it also lets you display follow buttons in your sidebar. We hope this article helped you find some of the best WordPress social media plugins for your site. If you’re looking for other ways to drive traffic to your website, check out our article on the best SEO tools to grow your website traffic FAST!